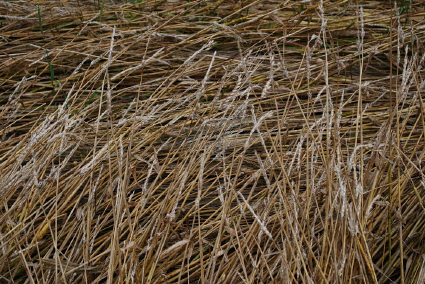 All seed-head & node photos are the property of the BLT Research Team Inc and may be used by others with written permission from Nancy Talbott. 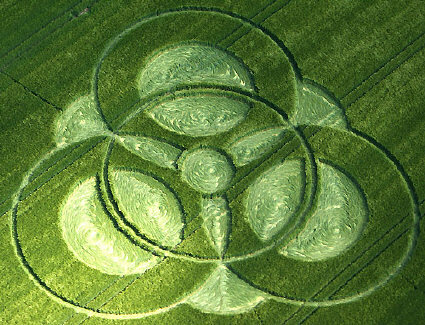 Please contact individual photographers of various crop formations if permission is desired to use their photos. This formation, which was the first to contain what some people interpret as a writing system of some kind, was examined only briefly by our fieldworker and the number of samples collected were, again, too few to form any clear impression as to causality. 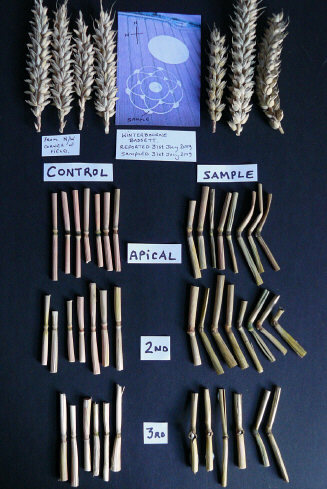 However, the wheat plants, which were only partially flattened throughout, do show expulsion cavities in nearly all of the 2nd nodes beneath the seed-heads and the seed-head development does appear stunted in the few samples we have -- both good indicators of the presence of microwave radiation at the time this crop circle was formed. On the other hand, the apical nodes do not appear to be elongated, an unusual finding when expulsion cavities are present in the lower nodes. cavities in 2nd & 3rd nodes, but no apical node elongation. & controls in close-up photo. do contain clear expulsion cavities. 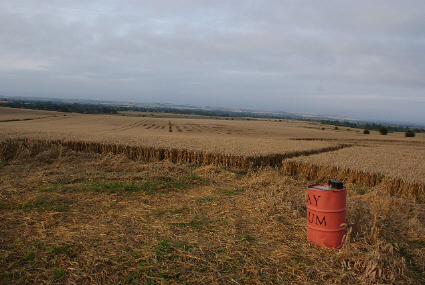 3 days after farmer had cut out the first. 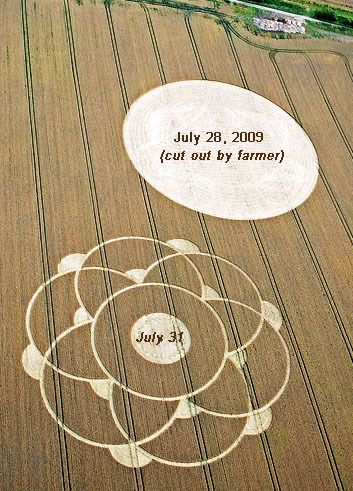 Several formations occurred in 2009 which were immediately cut out of the fields by the farmers and in several of these cases a new formation (or an "addition" to the one that had been destroyed) occurred almost immediately afterward -- either in the same field, or nearby. 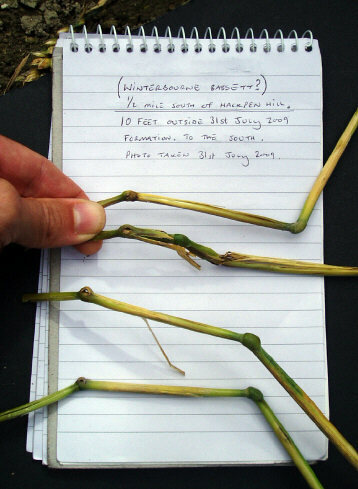 It was a stroke of luck that our fieldworker managed to get to one of these cases, arriving back in Wiltshire on July 31st just as the 2nd formation at Winterbourne Bassett appeared (and only 3 days after the 1st one had arrived). 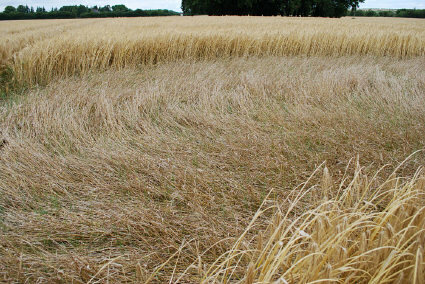 One of the few ground photos taken in the first (July 28) Winterbourne Bassett circle. 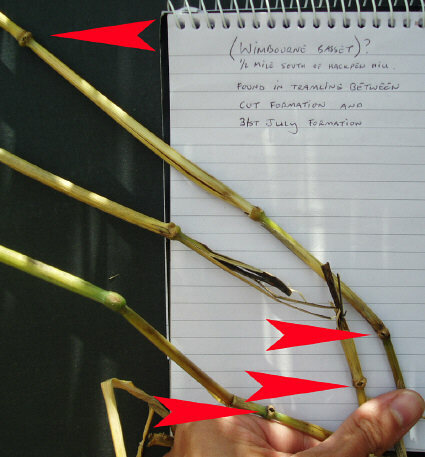 Because the tops of the plants in the first formation had been cut only the bottom two nodes were available for examination, and many of these cut stalks showed clear node bending at the 3rd node below the seed-head. 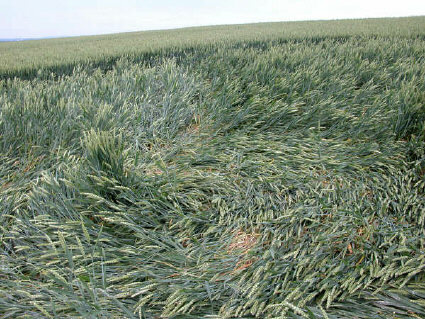 Since only three days had elapsed -- and since photo- and/or gravitropism (the natural recovery processes of downed plants as they right themselves to sunlight and gravity) does not occur to any significant degree in crop as mature and dry as this -- the node bending here is highly indicative of the plants having been exposed to a plasma energy system discharge. The samples from the cut formation also showed expulsion cavities in both of their lower nodes (again, just 3 days after the circle had appeared), another good indicator of exposure to microwave radiation. 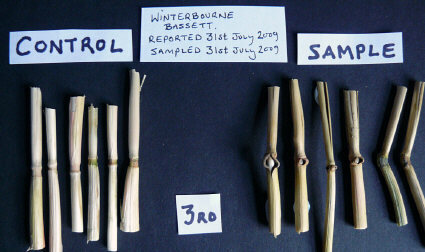 Winterbourne Bassett #1, with significant bending at 3rd node. So far as we know no intact plants were sampled and therefore no apical node evaluation is possible, but based on the presence of clear bending of the 3rd node & expulsion cavities in both lower nodes just 3 days after the circle formed it is highly unlikely that this event can be attributed to "pranks with planks." 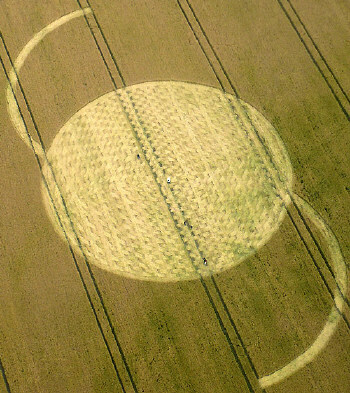 Our fieldworker was able to examine the 2nd Winterbourne Bassett circle the same day it appeared, only hours afterward. In this formation partial seed-head dehydration, node-bending (present that very first day), node elongation in the 2nd nodes, and expulsion cavities in the 3rd nodes are very strong indicators of authenticity, particularly because these plant changes were all present immediately. 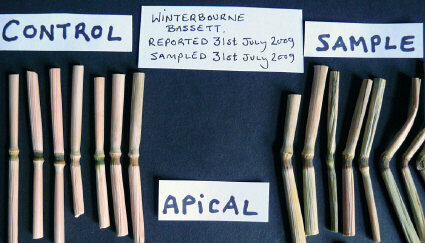 Winterbourne Bassett #2. Photo: Peter Tadd. 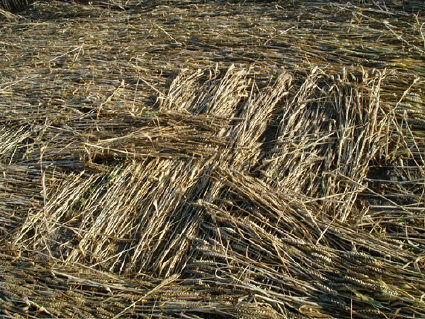 (in very dry crop) cannot be due to photo -- or gravitropism. nodes of #2 cannot be due to natural recovery processes. 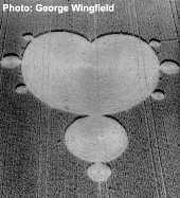 Because of the proximity of the two formations, and because the BLT plant work during the 1990s revealed that standing crop (both outside circles and inside them) is sometimes also affected, the standing plants in-between these two formations were also examined. 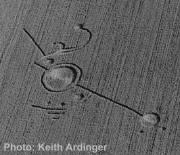 Node elongation, marked node bending, and expulsion cavities were found throughout this standing crop in-between the two crop circles. on same day formation #2 appeared. 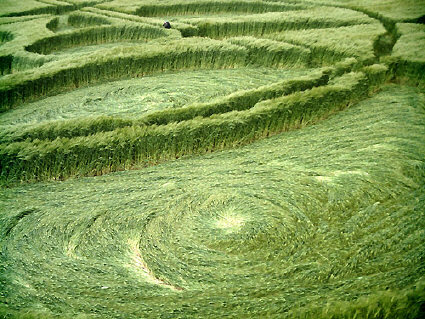 When the crop along the edges of tram-lines in between the two formations was examined many plants were found to have multiple expulsion cavities. tramlines which ran through both formations. 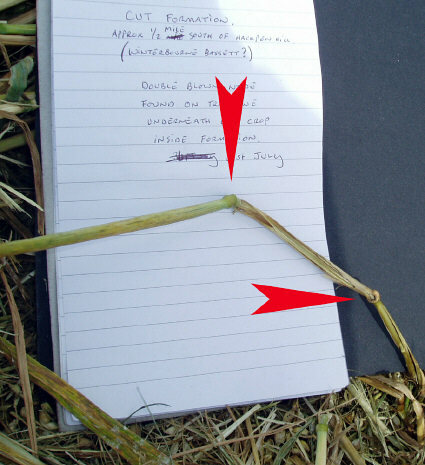 found in crop along tram-line 10 ft. south of formation #2. 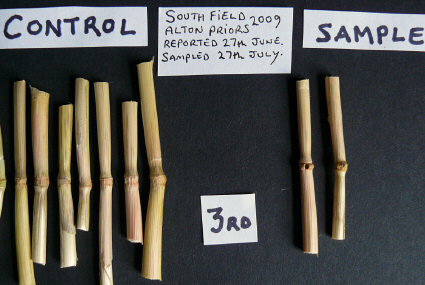 The presence of expulsion cavities in Winterbourne Bassett #1, the marked bending and expulsion cavities found in Winterbourne Bassett #2 -- on the same day it appeared -- as well as the multiple plant abnormalities found in the standing crop in-between the two formations and along the tramlines that intersected them strongly indicate that this field was exposed not just once, but twice, to microwaves emitted by a plasma discharge. The BLT fieldworker did manage to get to a few other formations, but in these he either found very little plant change or none at all. 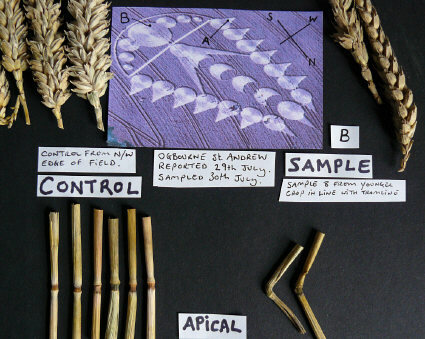 In the July 29th Ogbourne St. Andrew "trilobite" a few of the sample seed-heads were clearly desiccated and a few apical nodes showed extreme elongation and bending the day following the formation's appearance. 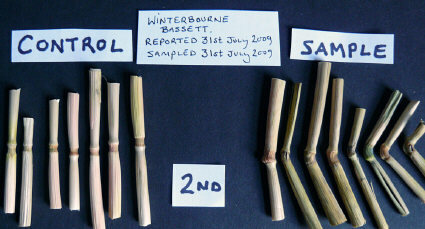 But in both the Ogbourne St. Andrew formation and one at Martinsell Hill we simply don't have enough samples to offer any evaluation. 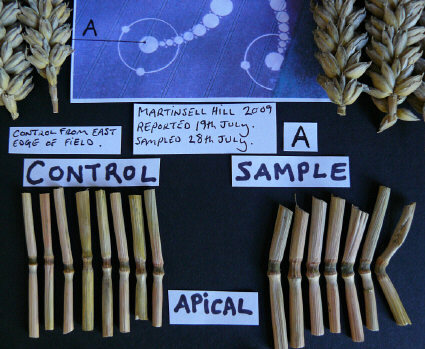 but only in a few samples, the day after circle occurred. 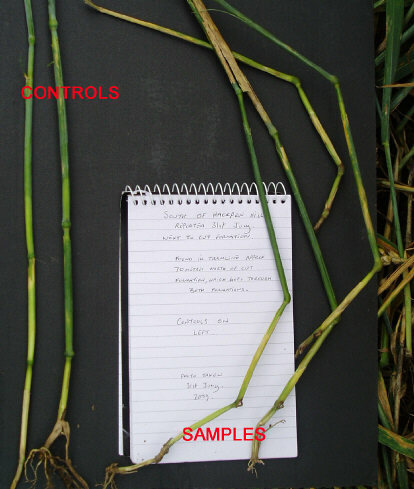 And finally there were a few other formations examined by our fieldworker in which he saw no evidence of any plant abnormalities. 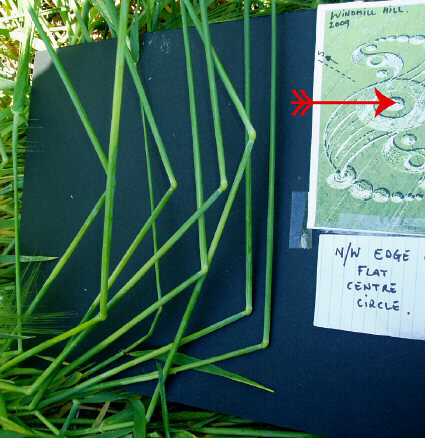 Node bending was observed in the May 25th Windmill Hill formation which was visited 6 days after it appeared. 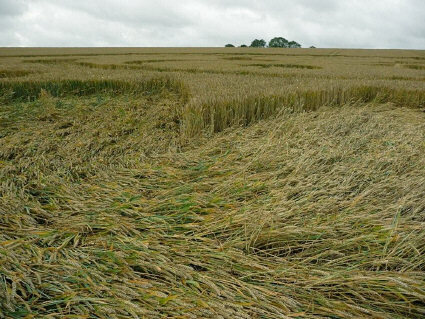 But this degree of node bending in young and vigorously-growing crop -- particularly since no other plant abnormalities were seen -- is almost certainly due to the natural plant recovery processes (phototropism and gravitropism). 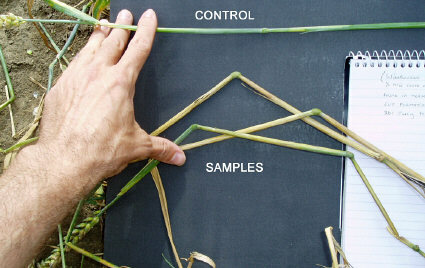 In young crop these natural recovery processes begin immediately if the plants are not killed when flattened, and control studies have shown that the degree of node bending visible here can occur within six days when young plants are downed early in their growth-stage. plants reorienting themselves to sunlight & gravity. any of the circle plants examined. Photo: Russell Stannard. 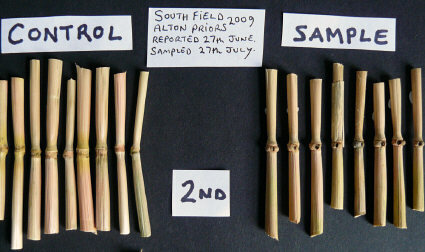 also showed no plant abnormalities whatsoever. Readers must remember that in none of the formations discussed here was a full-scale sampling with subsequent laboratory testing carried out. 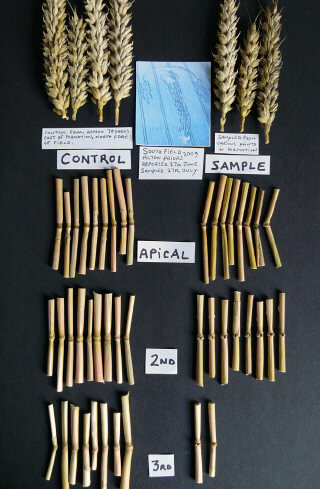 Without in-depth sampling and some of the testing that can only be conducted in the lab, we can offer only educated observations based on the extensive work carried out and published (http://www.bltresearch.com/published.php) in the 1990s. 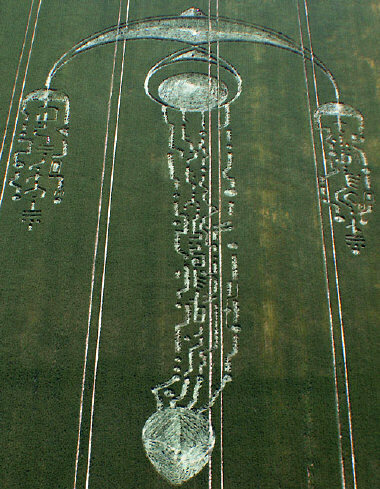 This report is intended primarily as a guide for those crop circle enthusiasts interested in learning about the physical changes to plants in crop circles -- the visible plant abnormalities which have been scientifically determined to be significant indicators of the effects of an energetic plasma discharge in the fields, rather than the result of mechanical flattening. 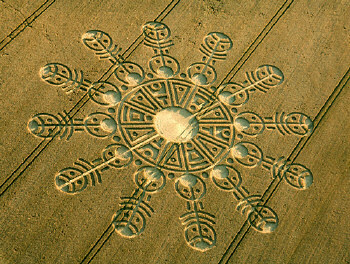 July 6th, Honey St. "addition"
June 21, 23 & 30, Milk Hill "3-phase"
July 5th, Silbury Hill "Mayan Mask"
June 24th, Rough Hill "Mushroom"
July 14th, East Field "woven"
lay patterns. Photo: Andrew Pyrka. 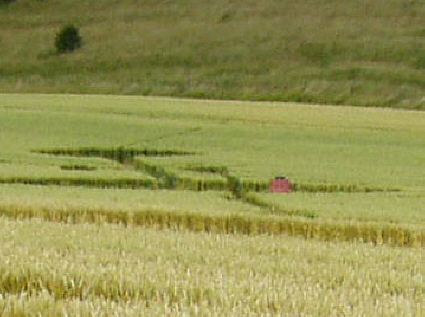 Our valued Norwegian colleague (http://www.cropcirclesnorway.com/), Eva-Marie Brekkesto, visited this formation on July 18th, 41 days after it had appeared, and noticed that the seed-heads in the larger flattened areas were all either apparently very poorly developed or missing altogether. 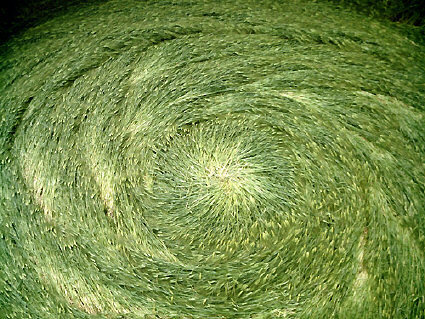 She also noted that the seed-heads in the narrow internal ring bordered on both sides by standing crop appeared normal and intact. he saw no "clearly bent nodes." Mr. Armstrong's photos seem to indicate that the seed-heads were present when the formation first occurred, but he has posted no close-up photos of the plants and makes no mention of the seed-heads at all. Since we have no other information regarding the plants near the date of discovery and know that Eva-Marie's observations were made more than a month later, we suspect her photos -- which clearly show that the seed-heads are, indeed, almost entirely missing or appear to be very poorly developed in the larger flattened areas -- reflect the presence of hungry birds and mice. 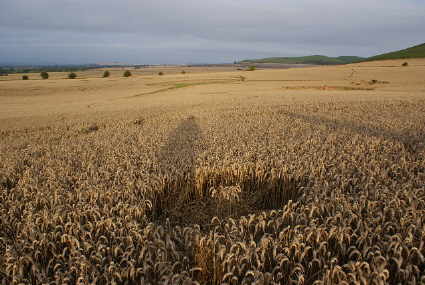 Once the plants are down the seed-heads are readily accessible to the wild creatures which are (because the downed plants provide easy access to their food source) almost certainly as delighted with the circle phenomenon as any of us. circle appeared. Photos: Eva-Marie Brekkesto. local wild residents. Photo: Eva-Marie Brekkesto. We thank all of our European and American colleagues who have contributed information and shared their photos for this report. It also could not have been produced without the terrific assistance of our observant UK fieldworker (who prefers to keep a low profile, at least for the time being). We, also, have noticed in the past that a great deal more can be accomplished in the fields when one is alone and totally focussed on the task at hand. However, one has to wonder just how "alone" our intrepid fieldworker really was -- at least on this late summer afternoon in the 3-phase Milk Hill formation. 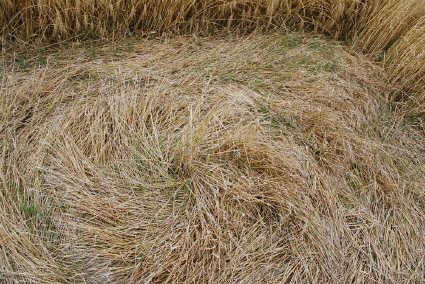 He had been working in the field for awhile and, so far as he knows, he was absolutely alone...but just as he was finishing his sampling he took a few photos, in one of which this unseen companion appears. pink "pig man" there to keep him company?